Born in Beirut, Lebanon in 1955, Mr. Siblani came to the United States in 1976 to pursue his education. He completed his B.S.S. in electrical engineering in 1979 at the University of Detroit. In 1980 he assumed the position of Vice President at Energy International, Inc., a major import-export firm dealing with the Middle East. He held this position until he began The Arab American News in 1984, at which time he resigned to run the newspaper full time. Siblani’s prime motivation for beginning the newspaper was the 1982 Israeli invasion of his homeland Lebanon and the startling discovery of the biased fashion in which the major media in America covered such events in the Middle East. In addition, he had settled in the nation’s largest Arab American community, in Metropolitan Detroit, and thus he believed the idea for a community newspaper was viable. Siblani has now published The Arab American News for thirty-five years. The newspaper rapidly became one of the local and national media’s most popular resource for American-based Arab and Arab American opinion and analyses. Mr. Siblani’s rare political acuity is appreciated by the media. He also has a well-deserved reputation for honest yet engaging interviews with an eye and ear for both the culture and political milieu he lives in and those of the region of the world he was born in. He effortlessly bridges the knowledge and understanding gaps that exist in American audiences and is an expert producer of useful sound bites. He is nimble with analogies that quickly illuminate issues for those whose backgrounds are sketchy. Siblani has always been a staunch supporter of Palestinian rights and opponent of Israeli occupation and aggression. When Palestinian was considered the “P” word and virtually no one talked about the subject in public, Siblani stood up and shouted from the pages of The Arab American News and whatever opportunities he could get with the media. He was a fearless and vocal opponent of the 1991 Gulf War tirelessly making back-to-back media appearances and giving print interviews in an effort to avert certain disaster for the Arab World. He did the same in trying to avert the 2003 invasion and occupation of Iraq. He vehemently opposes proposed American military intervention in Syria and Yemen. Newspapers throughout the world including Japan, China, India, Pakistan, Africa, Britain, Europe, South America and the Arab World. Successive American administrations have sought Mr. Siblani’s counsel at the White House and the State Department on issues related to the Arab World He attended the Arafat-Rabin-Clinton White House signing ceremony As a journalist, the White House and State Department press offices stay in contact with him and he has attended White House lawn picnics for the media. Siblani’s influence extends abroad as well. He met with several Arab world leaders, including Syrian President Bashar Assad and Syrian Vice President Farouq al-Sharaa, as well as with Lebanese President Michelle Suliman among other Arab leaders. He has been a guest of former Tunisian President Zine al-Abideen bin Ali, late Palestinian President Yasser Arafat, former Malaysian Prime Minister Mahater Mohamed, among other world leaders. Journalists have applauded Siblani not only as a source but as a peer. In 2003, he addressed the American Society of Newspaper Editors at their annual convention. He is a frequent lecturer on U.S.-Arab relations and the role of ethnic, minority and alternative media in America, at several American universities, including the Columbia University School of Journalism, the University of Michigan Ann Arbor, Michigan State University, Central Michigan University and Wayne State University, among others. He hosted, in 2011, the Asian American Journalists Association (AAJA) convention in Detroit with a grand opening reception in Dearborn, MI. 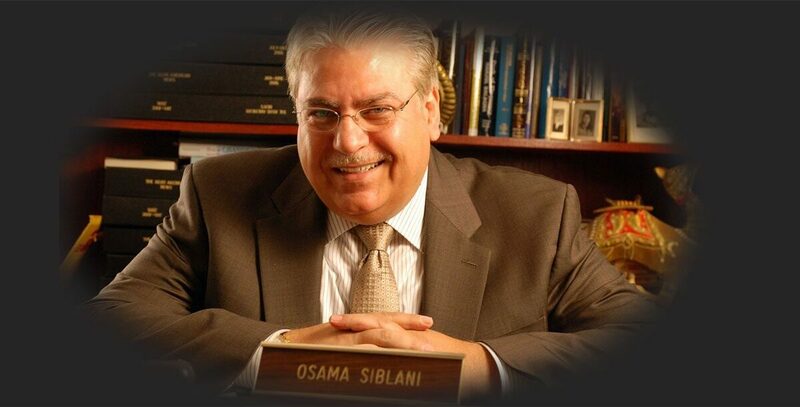 Mr. Siblani has also become the voice of the Arab American community. While smaller papers have sprung up and fallen by the wayside, The Arab American News just keeps getting stronger. Siblani helped found the Arab American Political Action Committee (AAPAC) in Dearborn and the Congress of Arab American Organizations (CAAO), which is an organization with an unprecedented success at fostering cooperation among the community’s many groups. Siblani is the recipient of several awards from local and national prestigious entities. He received the “Spirit of Diversity in Journalism” award from Wayne State University, during the 10th Annual Helen Thomas Awards on April 16, 2010. Siblani was inducted into the Michigan Journalism Hall of Fame in April 2013. He is the first to be inducted from an ethnic media outlet, and the second Arab American, after the induction of the legendary late Helen Thomas in 1993.